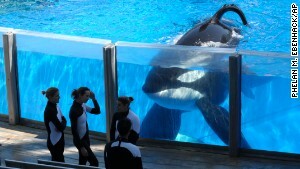 "Blackfish" tells the tragic story of a SeaWorld trainer killed by a 12,000-pound orca in 2010. Watch an encore presentation of "Blackfish" on Saturday, December 20, 2014, at 7 p.m. ET. Did SeaWorld rig 'Blackfish' poll? Could marine theme parks transform into orca sanctuaries? Did SeaWorld stuff ballots for 'Blackfish' poll? Is SeaWorld the right lesson for our kids? Blackfish traces a 39-year history of killer whales in captivity leading up to the 2010 killing of Sea World trainer Dawn Brancheau by the 12,000-pound orca, Tilikum, a whale previously associated with the death of two other people. Blackfish chillingly shows that this incident of violence is hardly an isolated one, along the way exploring the extraordinary nature of orcas, thought to be one of the most intelligent species in the animal kingdom.